Emil Grunzweig, a key activist in Peace Now, was murdered on February 10th, 1983 during a demonstration that set out from Zion Square and moved towards the Prime Ministers’ Office in Jerusalem. 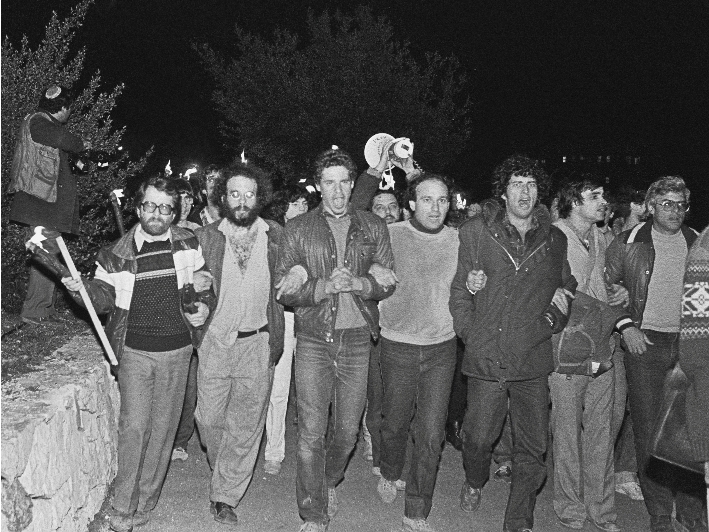 At this demonstration, Peace Now demanded from Menachem Begin, then Prime Minister, to adopt the Kahan Committee’s recommendations. The committee (which investigated the Sabra and Shatila transgressions) has criticized the Prime Minister and the Minister of Foreign Affairs but did not find them fully responsible for the massacre. Ariel Sharon, who was the Minister of Defense during that time, was accused of intentional ignoring the rampage and therefore the committee recommended that he should resign from his role. Because Begin did not immediately declare endorsement of the recommendations, Peace Now decided to hold a demonstration. The demonstration was soon surrounded by a right-wing, hostile and violent crowd, while it kept on moving towards the Prime Minister’s Office among shouting, cursing, pushing and hitting. In the last minutes of the demonstration, Emil Grunzweig was murdered by a grenade that Yona Avrushmi had thrown into the crowd. In his confession, Avrushmi claimed that he was incited by Right-wing extremists that later on denied their accountability. In addition, nine Peace Now activists were injured, among them was Avraham Burg. Emil immigrated to Israel in 1963, after his family survived the Holocaust. He participated in four wars as a soldier and as an officer in the IDF. After his release, Grunzweig worked for social causes, such as education, coexistence and tolerance between Jews and Palestinians.